Most of my readers are familiar with the Avon cosmetics company and know that the company has also been designing jewelry since the 1970s. But do you also know that some of the jewelry made by Avon was inspired by notable personalities? During the 1980s and 1990s many designs were inspired by the likes of Kenneth Lane, José and Maria Barrerra, Louis Ferraud, and Corinne Simpson among others. This has given rise to the high level of collectibility of designs with these additional logos. This design is called “Passion Flower Collection”, and includes a brooch and pair of matching clip earrings. No detail has been spared in the design of this set. which helped Avon join the ranks of famous designers and producers of high end jewelry. Inspired by the star's passion for rose, the goldtone rose has sparkling rhinestone accents which look a lot like dew drops. The pieces are marked Elizabeth Taylor - Avon, and is also inscribed with an “E” in a lovely script selected by Elizabeth herself. This fabulous Elizabeth Taylor Avon rhinestone rose flower Demi Parure is available from my Vintage jewelry Lane shop for $125.99. If you are a fan of Elizabeth Taylor, you may be interested in the book Elizabeth Taylor’s Personal Jewelry Collection – My love affair with Jewelry. Known for her beauty, her seven marriages, and her stunning jewelry collection, screen star Elizabeth Taylor treats us to a first look at her jewelry, in gorgeous actual-size photos and in personal photos-some never before seen publicly-of herself wearing them. This book showcases many of the pieces from her collection with 125 stunning photographs. Since the Elizabeth Taylor line of Avon jewelry was discontinued in 1997, it is becoming increasingly hard to find and is now very collectable. Nice Jewellry. 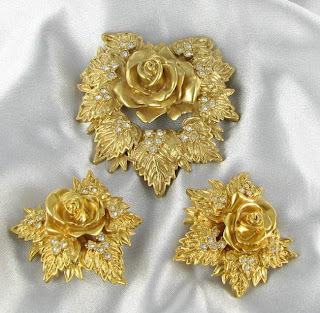 I really love the above golden rose pieces. These are looking exclusive one. Nice piece of jewelry. 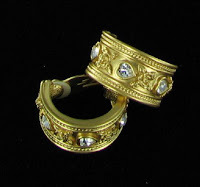 Jewelry are very graceful i love it to give a gift to my love one.